Part of Antakya’s larger Archaeology Museum, the mosaic exhibits here are famous, and reason enough, in themselves, to come to Antakya. Some of the best Roman and Byzantine mosaics in the world are to be found in this museum… Beautiful pieces are at every turn, some only fragments, others marvellous in their size and splendor. 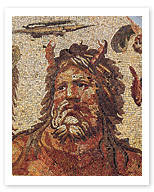 These mosaics are fine pieces of art, and of history, and well worth seeing.